BOSTON, March 28, 2012 – A total of 2,350 single-family homes sold in Massachusetts last month, the highest sales volume for the month of February in five years, according to a recent report by The Warren Group, publisher of Banker & Tradesman. 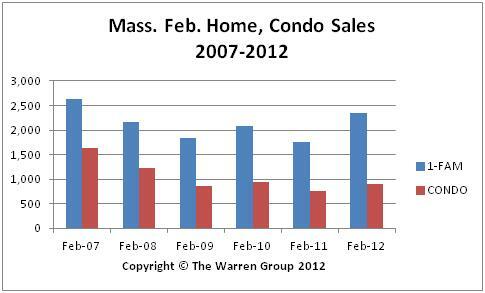 February home sales rose 33 percent statewide – an increase from 1,765 sales in February 2011. This is the largest sales volume recorded during the month since 2007, when there were 2,628 transactions. The 33 percent gain represents the sharpest increase in year-over-year sales volume since May 2010 when sales rose almost 35 percent. This is the second consecutive month that sales are on the upswing. So far this year, single-family home sales are up 15.8 percent from a year ago. Statewide, a total of 4,764 transactions were completed in the first two months in the year, up from 4,114 during the same period in 2011. The median price for a single-family home dropped almost 3 percent last month to $245,000 from $252,500 in February 2011. The year-to-date median home price is down about 4 percent – dropping to $250,000 from $260,250 last year. February condominium sales also increased last month. There were 892 condo sales in February, up almost 18 percent from 757 sales during the same month last year. Year-to-date condo sales also rose 5.3 percent to 1,789 from 1,699 last year. The median price for condos sold statewide in February increased 4.7 percent to $235,535 from $225,000 during the same month last year. The median selling price for condos sold in January and February was $240,000, a 1.3 percent increase from the $236,900 median price recorded a year ago.